A fantastic jukebox pendent, made from the photo of a handmade paper sculpture, on a traditional curb chain necklace. 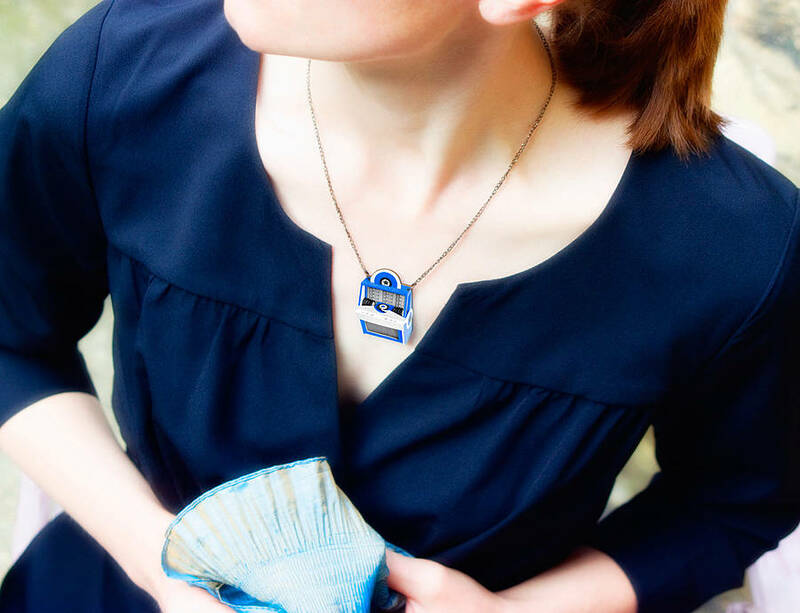 The pendant is an image of a three-dimensional paper sculpture created by Jacqueline Wagner. It is professionally printed onto thick sturdy cardboard and protected by a layer of clear varnish. The back of the pendant is plain black with a ‘made of varnished cardboard’ sticker. 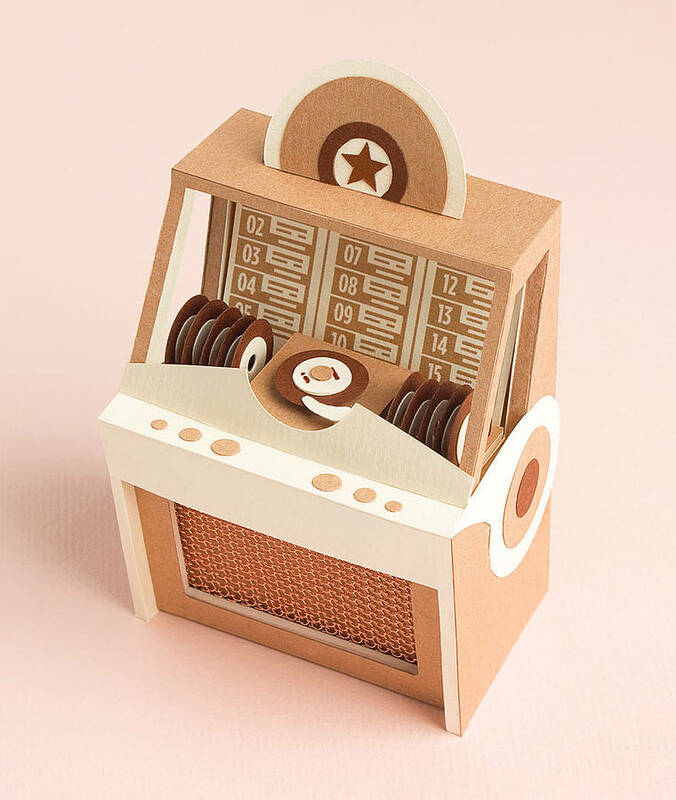 Your jukebox part of a splendid paper craft collection, designed in the smashing style of the 1950’s. 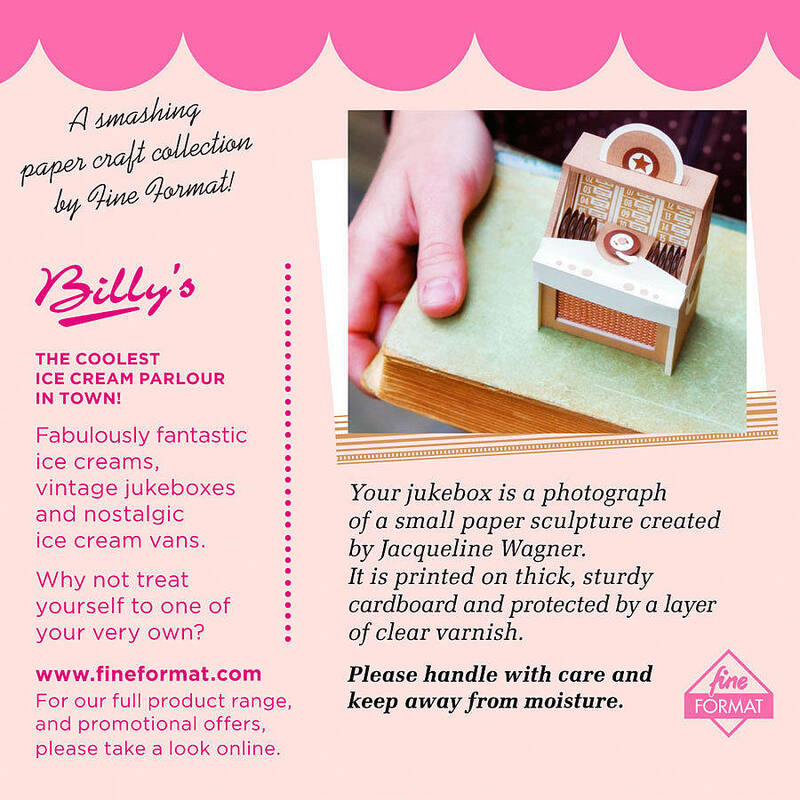 The collection is inspired by American ice cream parlours. 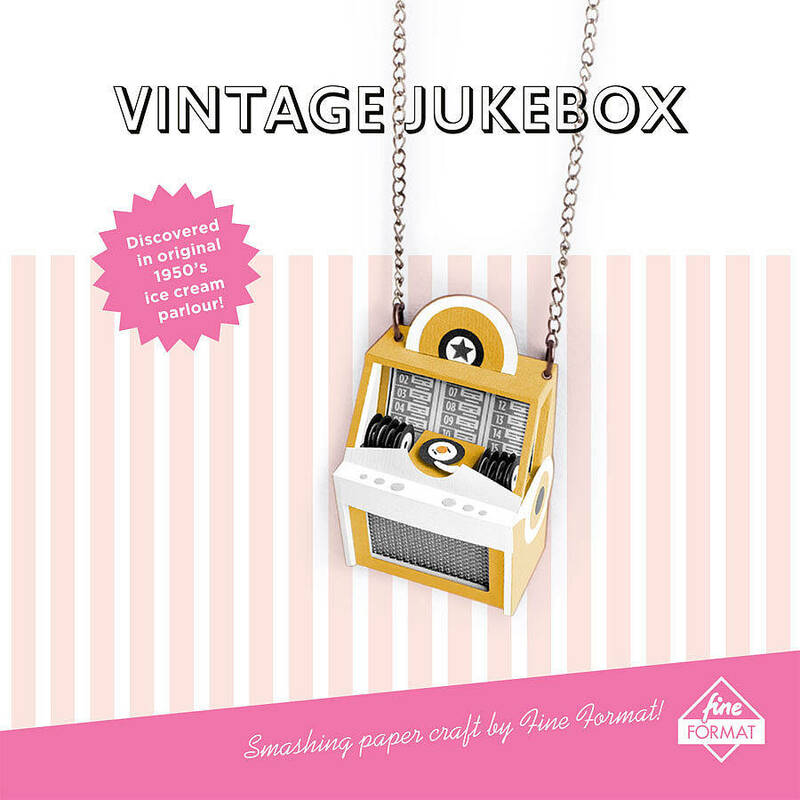 Your jukebox was infulenced by the amazing designs of Rock-Ola and Seeburg jukeboxes that entertained youngsters after the bowling or before the movies. 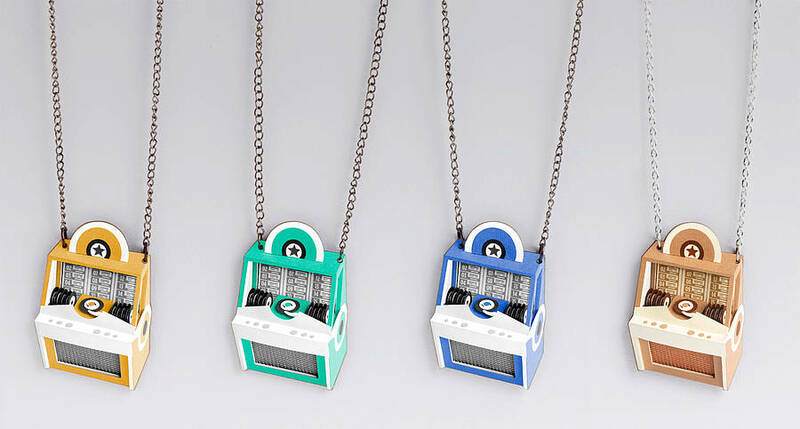 The necklace is available in four trendy colours: cool green, royal blue and mustard yellow jukeboxes have with a black chain. 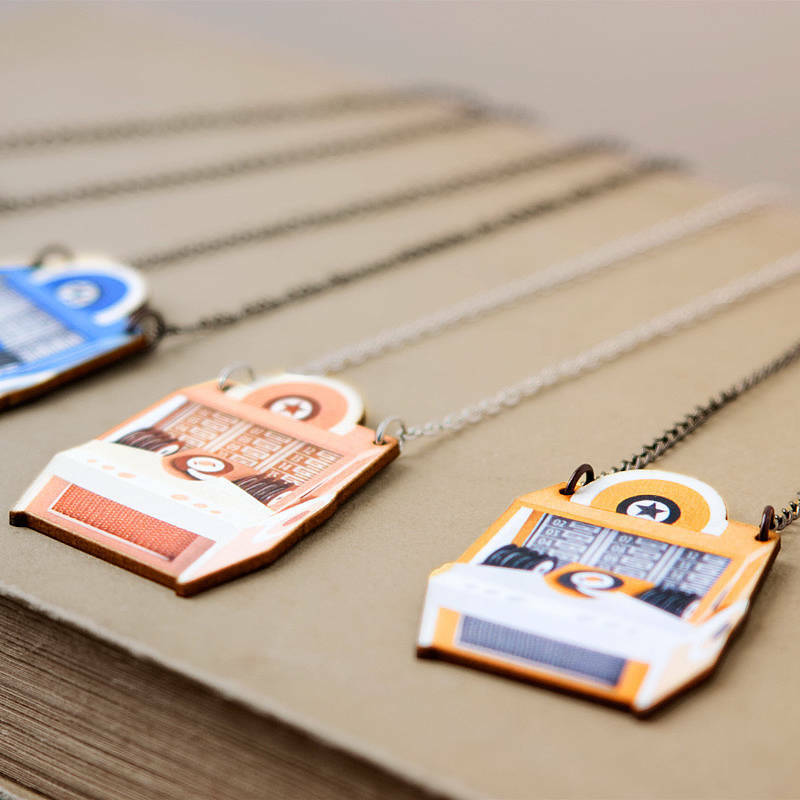 The beige brown jukebox has a silver plated chain. Remember those happy hours you spent as a child with scissors in hand and coloured paper glued to your fingers? That was Jacqueline's starting point for creating this small three-dimensional paper sculpture (shown in the last picture). Today she mainly works with a scalpel and often uses a pair of tweezers to ensure precision when creating her whimsical paper sculptures. "It often takes me quite a while until I'm happy with all the details. Sometimes I really can't say what's wrong I just know it's not quite there yet. Then it's just a case of trying different options." Once Jacqueline is happy with the result we photograph the object and get the image ready for print. All designs are professionally printed. The shapes are laser-cut and varnished by hand. 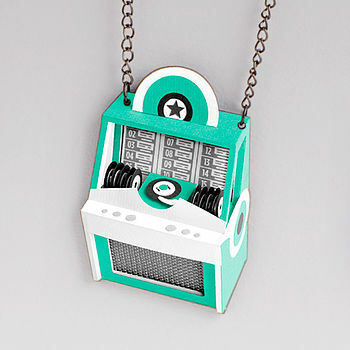 The last step is to affix the chain and sticker and pack your necklace. For long-term enjoyment, please handle with care and keep away from water. The front and back of the pendant can be lightly wiped clean with a damp cloth, but please do not dip into water. 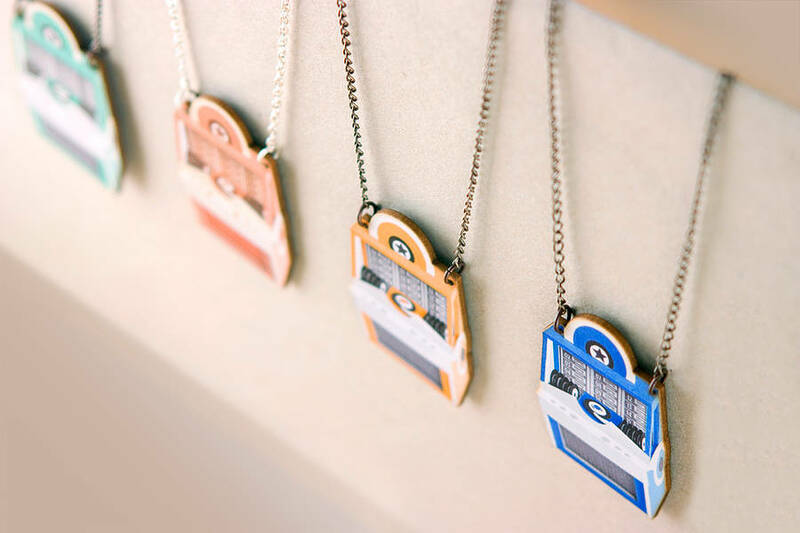 The necklace comes with a professionally printed card and packed in a clear (biodigradable) plastic bag. The chain is approx. 40cm long, so that it sits a few centimetres below the collarbone. The pendant is approx. 3cm wide and 5cm high. This product is dispatched to you by Fine Format.